WHEN is a city car not really a city car? Ironically, when it's called a Honda City. The Japanese manufacturer introduced the model way back in 1981 (Australia received a two-seater van variant), and by all accounts it was a tiny little thing ideal for nipping into tight spaces in downtown Tokyo or Sydney. Now in its sixth generation, the City has morphed into a decent sized sedan, making it look far from modern city car offerings like VW's Up! or the little-loved Smarts. 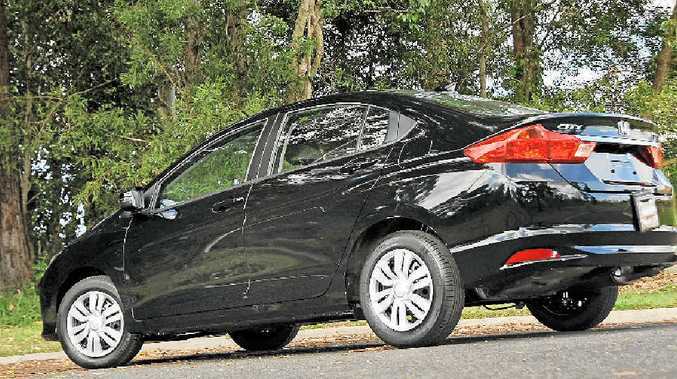 The outgoing Honda City wasn't much to shout about - it lacked any sort of charisma or driving joy - but did offer decent space at a good price, complete with that trusted Honda badge that inspires a great deal of brand loyalty. The freshly-released new City is once again not targeting those seeking driving thrills, but looks excellent value at its entry-level point for those after a sedan that will seat five adults in comfort, offers decent luggage space and most of the toys demanded by today's buyers. It's also not bad looking either, albeit our test model - the basic VTi - did look underwheeled as the 15-inch steel wheels struggled to get anywhere near to filling the arches. The City's overall design will give the young and young-at-heart enough to smile about however with its large angular lights front and rear, and an unmistakeable Honda visage. Really making a case for the City is its price. Meeting the market in the ultra-competitive sub-$25,000 light car class, you can drive away a manual Honda City for under $18k. Look around the other models at this price point and the Honda badge does stand out as one a lot of buyers will trust. And while we're singing its praises, a reason buyers would opt for the City over Honda's more popular Jazz model is its boot space. At 536-litres, the rear cargo area is mighty for this small car. To put it in perspective, your 2014 Holden Commodore has 40-litres less to offer than the City. But can such aspects turn the tide for the City; after all it has hardly been breaking sales records. In 2013 the previous generation City shifted only 679 examples. Its stablemate Jazz notched 5726 sales for Honda at roughly the same price: a huge advantage for the hatchback. The all-new City deserves a look however. For the price you do get a decent amount of standard kit, including enough modern technology features to appeal to younger buyers as well as the City's typical retirement-age shoppers. The 17.7cm colour screen should be looked at by numerous other manufacturers as to how simple, attractive and user-friendly these things can be. The rear-view camera operates through the screen. It's easy to access your phone's music library and all the vehicle trip information. A tap, pinch or swipe of the screen has you in full command, and if you have an iPhone 4S or above, the HondaLink platform means you can access your supported smartphone applications. Big tick here, and all as standard even in this basic City. But there's more. You also get cruise, Bluetooth, HDMI plug, USB port, plenty of steering wheel controls and even hands-free voice commands to access your entertainment system. The rest of the dashboard and controls are straightforward and uncluttered - no doubt a huge selling point to the more mature among us not wanting to be besieged with buttons and switches - and it is all illuminated in a cool blue hue. Front seats are basic but comfortable, while in the back I had reasonable leg and head room as a six-footer, across all three rear seats. With the mighty boot, it's a wonder how Honda has fitted all this space into the package. With the cheapie price however the goodies and positives have to end somewhere. It's no premium interior with cloth seats, hard plastics and urethane-coated gear knob and steering wheel (leather comes with the higher-spec City models), but it's certainly no worse than its similar-priced rivals. I may be playing at stereotypes here, but I'd suggest the majority of City buyers will be using their sedan for getting around town with the occasional motorway journey. For these, it performs just fine. To be fair to those who do enjoy a bit of verve with their drive, the City isn't a prime pick. With 88kW from its 1.5-litre petrol it is somewhat lacklustre, and when you do floor it the four-cylinder is noisy. That said it's a flexible little motor that works well with the CVT automatic, and if you keep things reined in it's as quiet and composed as you'd expect from a Honda. Handling is also not there to offer thrills, with not much steering feedback, a bit of body roll and the skinny rubber of the 15-inch steel wheels struggling for grip when enthusiastically put into a corner. Honda has correctly set the City up for more sedate driving of course, and it does perform well in such circumstances and feels comfortable in a way that belies its small size. Keeping things under control also returns a quoted consumption figure of 5.7 litres/100km, which is more than acceptable. Honda should reserve its "The Power of Dreams" catchphrase for some of its more aspirational model offerings, but the City fills that sensible gap that really will make a lot of sense for many buyers. Engine: 1.5-litre four-cylinder petrol generating maximum power of 88kW @ 6600rpm and peak torque of 145Nm @ 4600rpm. Bottom line plus on-roads: $20,455 (City starts at $17,990 for manual version).